This PNP417C with a custom tabletop surface is the best thing that’s ever happened to your conference room! Using your table cutout, the PNP417C is attached underneath, and when closed, the PNP417 matches the grain on the table perfectly. ALTINEX provides three pre-configured templates for the PNP417C cutouts: round, rectangular, and square. A simple press on the lid closes the unit flush with the tabletop. The PNP417C design allows the connector panels to be easily installed. Just remove the top and slide the connector panels into place. In the open position, the PNP417C is functional yet maintains a smooth, clean appearance. The PNP417C comes pre-configured with two standard DS901-120 sectional plates. Each plate includes the following connectors: two AC power, one 15-pin HD (video), two RJ-45 (UTP), one RJ-11 (modem) and one 3.5 mm audio. There are two plates and all connectors on the plates are female receptacles. Each signal connector is connected via a 6-foot cable to its corresponding male plug at the opposite end. The AC power cables are terminated with standard NEMA plugs at the end of 9-foot cables. The PNP408 Interconnect Tabletop Solution is designed for installation into a conference room table. 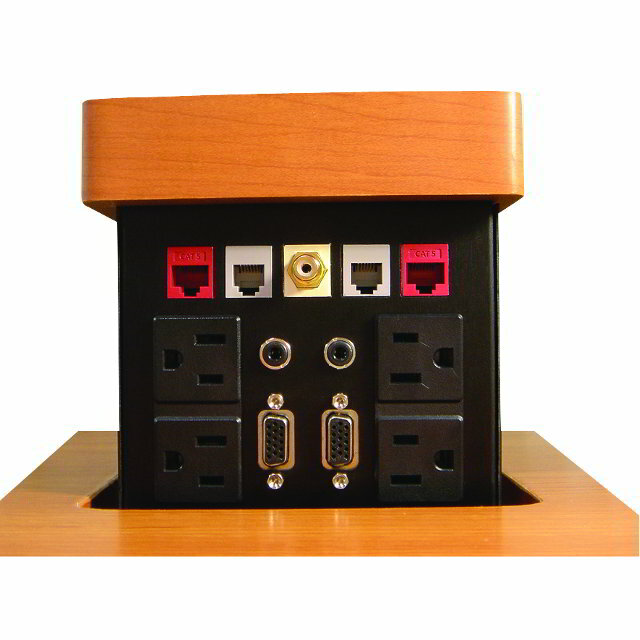 This Pop ‘N Plug uses a custom cut-out tabletop surface and hardware is attached underneath the cutout. When closed, the PNP415/417 lays flat and matches the grain on your table.